Less than a year after purchasing the property, the owner of the Lynn building that once housed The Daily Item newspaper has listed the property for sale for $1.5 million. As an agent for the building’s current owner courts prospective buyers, city officials overseeing a revitalization effort are providing assistance and paying close attention to who will move into the historic five-story building. 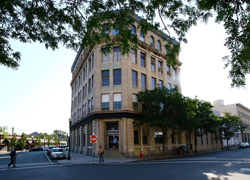 “We view it as one of the key buildings in Lynn’s downtown,” said James Cowdell, executive director of the Economic Development & Industrial Corporation of Lynn, which functions as the city’s development bank. The former Lynn Item building sits vacant in the downtown business district. The approximately 35,000-square-foot building in Lynn’s Central Square, which is currently vacant, has stood on the corner of Exchange and Mount Vernon streets since 1900, according to a listing by CBRE/New England, the property’s exclusive agent. The city most recently assessed the property’s value at nearly $1 million. Winchester-based US-1 Ventures bought the building from Hastings & Sons Publishing Co. at auction last September for $880,000, said Christine Diarbakerly, US-1’s founder. The sale came about a year after Hastings & Sons sold the Item to former editor Ted Grant. Diarbakerly had planned to renovate the building and rent out the first floor as commercial space, while turning the upper four floors into about 25 residential units, she said. But the magnitude of owning a building viewed as essential to rejuvenating Lynn is beyond US-1’s ambition for the property. US-1 had discussed the possibility of renting first-floor space to the proposed Equity Lab Charter School, but officials involved in the city’s development discouraged the prospective deal, Diarbakerly said. Equity Lab executive director Frank DeVito said Tuesday he is still interested in establishing the school in the building, but cannot enter into any official agreement until February, when the state Department of Elementary and Secondary Education decides whether to approve the charter school opening. Optimal use for the building, Codwell said, would consist of a first-floor commercial tenant that draws people into Lynn’s downtown — such as a restaurant — and market-rate apartments above. “It’s literally a 30-second walk from that building to the [commuter rail] train station, so we think it would be an ideal place for people who work in Boston,” Cowdell said. EDIC, the city of Lynn, MassDevelopment, and Congressman Seth Moulton are providing assistance in finding possible buyers, said Taidgh McClory, managing director of New England brokerage at CBRE/New England. With a number of other revitalization projects in the pipeline – including an $80 million, 348-unit residential waterfront development that Cowdell expects will begin construction next spring — it’s a great time to be involved in Lynn real estate, McClory said.